In a previous article, I explained the basics of making a multiplayer online game. From there, many improvements are possible and desirable with respect to clients synchronization, especially for more complex games such as Phaser Quest. A crucial aspect in real-time multiplayer online games is to keep all clients synchronized. In other words, to make sure they all share a similar view of the state of the game, without any discrepancies. The state of the game corresponds to the positions of all players and non-player elements, their status, the actions they are performing, and any other variables that can have any impact on the game itself. Synchronization is achieved by properly sending information to the clients so that they can update their representation of the game state. The quantity of data sent to do so, and the pace at which the data is sent, has important consequences. Too much, and you’ll exceed the available bandwidth, causing delays on the client side (and possible billing troubles on your side depending on how you host your server). Too little, and you risk that the synchronization might break and that the game states of the different clients start to diverge. In this article, I’ll explain the approach I adopted to manage client updates and synchronization in the case of Phaser Quest. The source code of Phaser Quest can be accessed on the Github repository. However, some of the code shown in this article is different from the code on the repository, because of additional optimizations that are not discussed in this article for the sake of clarity. The naive approach to clients synchronization is to have the server repeatedly send the entire game state to all clients, multiple times per second (e.g. 60 times per second). For example, the server could send, every 16ms, a JSON object containing the position of all players, monsters and items in the game. The clients would process this by iterating over all these objects and updating their positions if necessary. As you can see, this quickly gets out of hand, even for a very small payload and a very limited game state. This can be improved a lot by using what I’ll refer to as “delta packets”. The idea of delta packets is to send over only the changes that were applied to the game state, instead of sending the whole game states (hence the name “delta”, for difference). These packets consist in bundles of all the properties that have changed in any game object. If new objects have been added to the game state, the change is the creation of the object itself, and in this case all of its relevant properties need to be sent. Note: An alternative would be to broadcast the changes to all players a soon as they take place. This is not optimal, because of the overhead of sending lots of packets containing small amounts of update information. Bundling the changes together in update packets sent at regular intervals alleviates this overhead. In addition, given the relatively slow pace of Phaser Quest (compared to a FPS for example), these packets are sent 5 times per second, instead of 60. It turns out that this update rate is fast enough to represent the changes in the game (such as a player picking up an item or killing a monster) without any feeling of lag or stutter. Note: such a rate would not be suitable to update the position of the players, therefore a different approach is used for that; see relevant section below. This approach has two main advantages. First, the number of entities whose properties have changed between two updates is typically much smaller than the total number of entities in the game. Moreover, the number of properties affected is usually smaller than the total number of properties that the entities have. It follows from this that the amount of data to send to inform the clients about changes in the game state is much lower than the amount of data needed to send the full game state. Second, when nothing happens, no update is sent at all, which in terms of benefits is the extreme case of the above point. This benefit may not arise in a standard implementation (as a game where nothing happens is very dull), but when combined with an interest management system, it is quite possible to go through several update cycles without any updates to send, with significant savings in terms of resources. – Some of the actual code is actually a bit different and more complex than what I’m describing here, because I implemented a custom interest management system. – Covering all the code involved would be quite long and tedious and would be detrimental to the focus of the article. My attempt here is to convey the main idea of what has been done; for more details, I invite you to check the source code and to contact me to ask any question you might have. If I receive multiple questions on the same aspect, I’ll try to address it here. On the server side, all the game entities susceptible of being updated inherit from the GameObject object. GameServer.updatePacket is the object that the clients will receive at each update, containing the information regarding what updates to apply. Among other things, it contains associative arrays that map the id’s of game objects to smaller objects listings which properties have changed. Here is an example about changes affecting players. In this example, player 2 has had his life change to the value of 100, whereas player 9 has had his life change to 150 and his armor to 3 (the id of the actual armor object). Depending of the type of the modified object, a different map is selected, and key-value pair indicating the property that has changed and the value it has taken is added to the map. Every 200ms, the GameServer.updatePlayers() method will send the current updatePacket object to all clients, and then delete it to create a fresh new one ready to store changes to the game state for the next 200ms. On the client side, each property of the update packet is processed by the relevant methods. For example, the changes stored in updatePacket.players are processed by Game.updatePlayerStatus() and Game.updatePlayerAction(). What I have described so far corresponds to what I call “global” update packets; packets containing updates that will be them same for all clients and visible to all (e.g. if a player changes his armor, everyone should be able to see it). In addition to that, a similar process is used to maintain “local” update packets; changes specific to only one player and visible only to him. The local update packet of each client is bundled to the global update packet, so the client receives both at the same time, without any overhead. All the above works well for discrete changes, such as changes in appearance, monsters dying, objects being dropped or picked and so on. In order to work well for continuous changes, such as players moving across the map, the same logic could be used, but with a much higher pace of updates (at least 30 times per second). It is however possible, in the context of this game, to be smarter than that, by leveraging the deterministic nature of the pathfinding algorithm. In Phaser Quest, the trajectory of player movements is computed using pathfinding, with the easystar.js library on the client side (to compute the paths that the players will follow) and the pathfinding npm package on the server side (to compute the paths that the monsters will follow). When player A clicks on a tile, the algorithm computes the shortest path to that tile, and sends the computed path to the server. The server checks if the path is legal (i.e. if no cheating attempt was made), and if yes, it notifies all other clients that player A is moving. The computation of the path is deterministic, in the sense that the algorithm will always return the same path given the same pair of starting and ending coordinates, no matter what. In addition, since the obstacles in Phaser Quest do not move, a path is not at risk of changing during the movement, and therefore never needs to be updated. – The pathfinding computations are offset to the clients, leaving more resources to the server. – The server sends the endpoint of A’s path to all other clients. That’s it, one initial message and one single broadcast, for an optimal use of bandwidth and server CPU. The information about the path is added to the updatePacket introduced earlier, in the form of a Route object. This object contains properties such as the id of the moving player, the destination, what should be the orientation of the player at the end of the path (for when an action is performed at the end), etc. Although this approach removes the need to send position updates 30 times per second, the server still has to keep track of the position of the player throughout his movement. Player and Monster objects inherit from the MovingEntity object. // compute on which tile of the path it should be at this time. If path ended, check what should happen. The main problem with the approach described so far is that the clients don’t receive the movement notification at the same time, depending on the time that the packets take to reach them. If player A clicks on a tile at t0 and has a latency of 20ms, the message will take 20ms to reach the server. 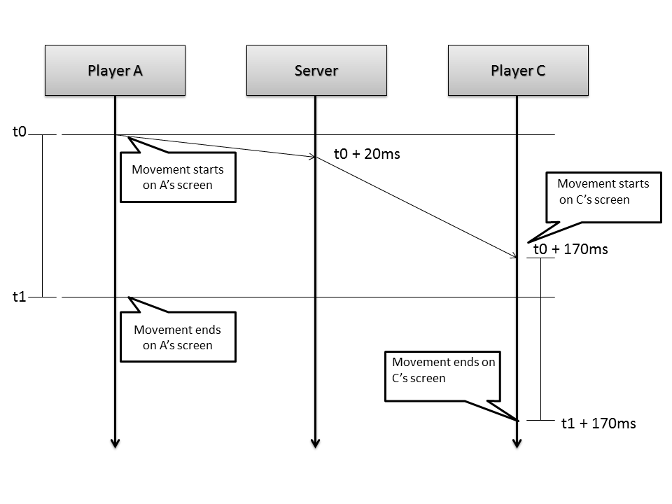 From there, it might take another 30ms to reach player B, but it could take 150ms to reach player C because player C has a bad connection. The result is that player A’s character will reach his destination at time t1 on player A’s screen, but it will reach it at time t1+50 on B’s screen, and a time t1+170 on C’s screen. Such a situation is not appropriate, as it breaks the clients synchronization. Upon receiving this information, player B’s client will compute the path between player A’s position and the end point (10,11). Assuming that player A starts at (0,11), the length of the path will be 10 tiles. Players take 120ms to travel a distance of 1 tile, so the duration of the tween that will move player A from (0,11) to (10,10) will be 1200ms. But as we now know, the server learned about A’s movement 20ms after it started, and B received the server’s notification 30ms after it was sent (this information is known to B as it is part of the update packet he received). In total, B was notified 20 + 30 = 50ms after A started moving. The natural fix is that on B’s side, the duration of the tween should be 50ms shorter, for a total of 1200 – 20 (A’s latency) – 30 (B’s latency) = 1150ms. For player C, we said earlier that his latency was 150ms. In his case, the correction will be 1200 – 20 (A’s latency) – 150 (C’s latency) = 1030ms. The result is that on the screens of the three players, A’s character will arrive at (10,11) at the same time, give or take a few milliseconds, thus achieving clients synchronization. Typically, such changes in tween duration are not very perceptible; either the tween lasts a long time, and a difference of even a few hundred milliseconds will be no difference, either the tween is short, and the tween will happen too fast anyway for a human observer to really perceive the difference. 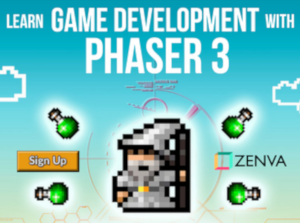 This article explained the main ideas behind client synchronization in Phaser Quest. Hopefully, this might be food for thought for the design process of your own game. Keep in mind that this solution worked for this game, but might not work as is for other games; networking solutions always have to be tailored to the particular aspects of each game. In this case, the fixed environment, deterministic pathfinding and the low pace of the interactions were the key factors. The delta packets concept is actually applicable to most games, as it is always better to encode differences in updates rather than full game states. For faster games, the rate of updates should simply be higher (up to 30 or 60 times per second). For fast-paced games with dynamic environments, in would be necessary to transmit the coordinates of the players at a high rate (at least 10 times per second). The time intervals would probably become too small to apply the correction described here based on the tween duration; some form of client-side interpolation to smooth the movements could be required instead. I refer you to Gabriel Gambetta’s and Glenn Fiedler’s pages for nice readings about existing solutions. In addition to this, Phaser Quest makes use of another optimization, called interest management. That one is usually considered a must, especially for massively multiplayer online games. If this article was interesting to you, consider having a look at my donation page. In particular, take a minute to have a look at my Patreon page, where you can find a listing of rewards for various levels of recurring contributions! Consider donating if this content was interesting to you and you wish to see more!